Luis Miguel and Daisy Fuentes were barely spotted arriving at The Forge Restaurant | Wine Bar in Miami Beach earlier last week due to extra thick security trying to block both parties from visibility. Both came in through separate entrances, then were escorted into the private wine cellar where they hosted an intimate group for dinner. With the entire restaurant packed with diners, the more curious guest sneaked to the back of the restaurant trying to get a peek at people coming and going but were disappointed to find that the entire wing and terrace were blocked off by security. Miguel and Fuentes who have a long history of on-and off-dom, were also escorted out separately after dinner. The V.I.P. experience doesn’t begin at the nightclub. It starts out at the dinner table. A plethora of Miami restaurants offer exclusive back room dining, so your chicest soirees can party in private. Here are five reasons to make reservations through the back door. The Forge: This year’s reinvention of Miami’s most notorious steakhouse, The Forge, was about more access and less excess. Its facelift also saw a revamp in its wine cellar, which offers a private (yet still affordable) dining experience. Dinner begins with a wine and h’ors d’oeuvres reception in the lower cellar before diners are escorted to a stunning 25-seat table, where chandeliers drip with glitz. 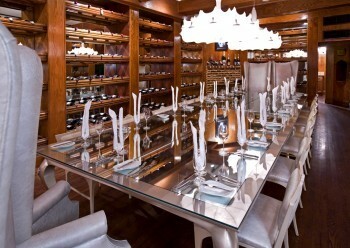 Home to 29,000 vintage bottles from all over the world, the wine cellar is great for accommodating intimate evenings. A rental that used to run $10,000 is now available to guests for as low as $100 per person — but The Forge remains as majestic as ever.